However, there is an abstract thing known as reality, and in reality things don’t always go as you planned or prepared for, otherwise there’d be no since in playing the game, everything would already be predetermined. 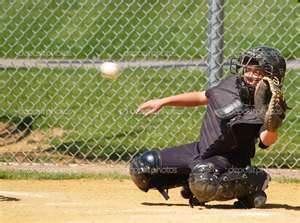 Simply put, there are times your catcher will reach for the ball, whether out of necessity or error, and not training for the possibly will not stop it from happening. The first thing you want to do with your catchers is sit them down together and talk about “Reaching.” After explaining they are not to do it, but admitting it may happen by mistake, go over the rules. 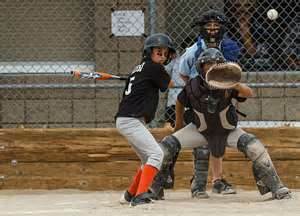 Rule Number 1: No matter what they are Never to reach across their body in an attempt to catch a ball. (a.) Any arm, MLB player on down, is not long enough to reach a ball across their body unless it’s a mere inch or two off to their side. They wouldn’t consider trying to catch a ball upside down because they couldn’t do it, and reaching across the body is the same thing. You just don’t do it. 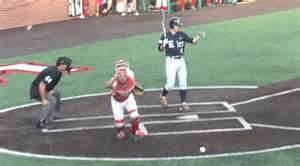 Rule Number 2: When, and I say when because it will happen, they are crossed up and surprised by the type of the pitch thrown, and it’s on their glove hand side, if need be, forget form and just try to catch it. (a.) Setting up and expecting a backward curveball in on a left handed hitter, only to realize you’re suddenly looking at a high fastball outside, is enough to put a catcher into cardio arrest. There are times when your mind and body just can’t react as fast as the situation demands, and to try and catch or stop the ball in a case like this is a heroic act. Rule Number 3: If you can not get into the proper position to block the baseball, and must reach out with the mitt in an attempt to catch the ball, position your mitt and hold it steady, Never swipe or swing at the ball with your glove. (b.) You’ll shorten your reach if the timing is not correct. If you hold your arm directly out to your side, it’s at a 90 degree angle to your body, but if you begin to move you’re hand forward in a swiping motion the angle decreases 90 to 80 to 50 and the lower the number, the less ground you’re covering, or another to put it, the more chance the ball has of going right by you untouched. (c.) Should you make contact with the ball while in a swiping motion, you will not catch the ball, you have a catcher’s mitt not an outfielder’s glove, and will only succeed in knocking the ball somewhere. Rule Number 4: Be prepared to immediately have to chase after the ball. Although there is a chance you’ll catch the ball, it’s more likely you won’t, so be prepared to immediately give chase, especially if runners are base. I have included this section, with a tongue in cheek attitude, because although it violates just about everything you want and train your catcher to do when attempting to block a wild pitch, it also realizes stuff happens. I believe the more situations a player is exposed to, whether by drill or discussion, the quicker he’ll react if and when he experiences it. It’s important to carefully explain this is not the preferred nor correct method for blocking pitches, but if they find themselves in this situation … they are to do….